Having celebrated its 30th anniversary in 2016, Beijing Sanyou Intellectual Property Agency Ltd was the first private IP firm in China. Now a leading IP law firm, Sanyou IP helps domestic and international clients to obtain and enforce their IP rights, while providing high-quality services. In 2011, upon the completion of a streamlining management procedure, Sanyou IP obtained the ISO 9001 certification for quality management. By emphasising professionalism and craftsmanship, Sanyou IP has been named an Outstanding Patent Agency and an Outstanding Trademark Agency for several consecutive years. Our team of motivated and professional attorneys represents a combination of the highest technical and legal qualifications and years of practical experience. Many of our attorneys have been practising since the establishment of the Chinese patent and trademark systems, and several are former senior patent examiners for the patent office of the State Intellectual Property Office (SIPO), or former first-rank examiners of the Patent Re-examination Board. Our clients, therefore, have the advantage of an unparalleled insight into China’s IP laws and procedures. 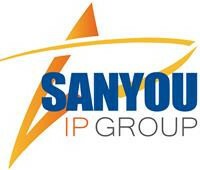 Sanyou International IP Service Ltd.
With such talented people, we offer a one-stop IP service to our clients. We provide a comprehensive range of IP services relating to the prosecution and litigation of patents, trademarks, copyrights, domain names, unfair competition and trade secrets. Our expertise encompasses all major technical fields, including biochemistry, biology, chemistry, computer science, physics, optics, materials, electrical, electronics, engineering, mechanics, pharmaceuticals and telecommunications. Our motto is “quality, efficiency and loyalty”. At Sanyou IP, we pride ourselves on the quality of our work and constantly strive to provide the highest level of service tailored to the individual needs of each client. Our team of top legal professionals, with its wealth of experience and proven success in the full range of IP services, stands ready to protect clients’ IP rights both in China and around the globe. As a standing committee member of the All-China Patent Agents Association and the China Trademark Association, Sanyou IP plays an active and important role in China’s IP industry. Sanyou IP is a member of several international IP organisations, such as the International Trademark Association, the International Association for the Protection of Intellectual Property and the Licensing Executives Society. Having been dedicated to intellectual property for over 30 years, Sanyou IP is always looking to improve its services and quality of work. The firm is trusted and supported by businesses across the industry.